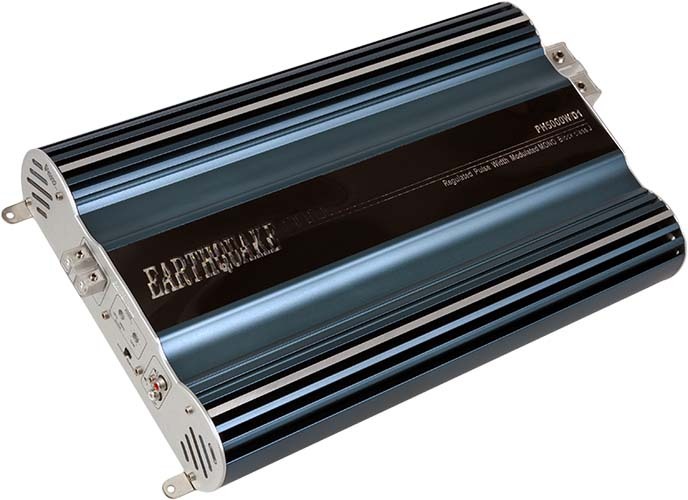 PH5000W/D1 - Earthquake Sound Corp.
Earthquake’s Class-J amplifiers deliver far beyond expectations with blazing performance, intelligent design, and unique features that are second to none. Operating in the range of 95% efficiency, the PH5000W/D1 delivers 5000 Watts of power with ease. Heat sink designs, larger input and output terminals, and precise fine-tuning have put the reigning champions in an untouchable category. The heat sink evenly distributes heat from the internal devices so the amp stays extraordinarily efficient and cool. Class “J” PowerHouse amps house power connectors 4-gauge and larger. All of these design features and improvements dramatically increase presentation, output capabilities, sound quality, and your standing in the winner’s circle. The PH5000W/D1 integrates innovative unique features: remote bass control, precise frequency selector crossover, and 0-180 degree phase shift adjustments. In addition to useful features such as: speaker & RCA level inputs, built in variable filters, and much more. The PH500WD/1 amp runs in mono mode and is capable powering up multiple subwoofer/s. They boast killer cosmetics and superior technological design.